You will very soon be able to take a first-hand look at one of the most interesting horror game concepts ever cooked up. Among the Sleep, in case you've forgotten, is the first-person horror game from indie studio Krillbyte in which you play as a two-year-old infant "in the borderland between dream and reality." The Kickstarter campaign that launched last month is winding up and it will be a close thing, with just five days left to earn $20,000 and reach its $200,000 goal. To give the process a push, the team is releasing a playable alpha version of the game tomorrow, giving people a taste of what's in store and hopefully convincing at least a few of them to throw some money at it. Krillbyte says the alpha has been polished up a bit (as much as these things are) and has implemented a feedback system so players can report any issues they run into or thoughts about what could stand to be changed or improved. 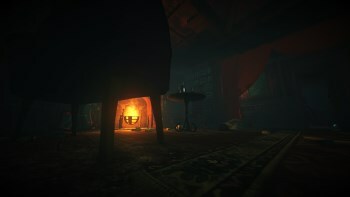 The team also announced last week that Among the Sleep will feature a "basic implementation" of Oculus Rift support, with "proper implementation" promised as a $225,000 stretch goal, and that Studio Jory, which has worked on literally dozens of games including Telltale's Walking Dead and Star Wars: Knights of the Old Republic, will be recording the game's dialog. The Among the Sleep public alpha will be downloadable from the Kickstarter page beginning at 11 am PDT on May 14.